I was just playing the board game Sorry! with some people, and I realized that I could base a few interesting challenges off of it. This one is pretty simple. 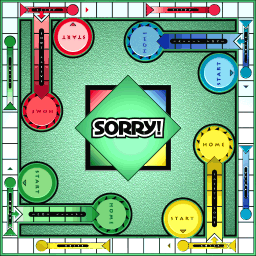 You task is simply to output an ascii-art version of a sorry board, placing pieces where I tell you to. The #'s are empty squares. The S's and H's are Start's and Home's respectively. The >v<^'s are the start of the slides, depending on which direction they face. The |'s and -'s are the middles of slides, depending on if they're horizontal or vertical. The o's are the end's of slides. Each column is separated by a column of spaces to make it look more square-like. Your input is a list of coordinates of various pieces that have been placed on the board. The coordinates start at 0 at the square outside the Start of the bottom color (yellow in the picture), and increase by one per square clockwise. After these 60 squares, the safe zones have the next and last 20 coordinates, starting from the one on the bottom (which gets 60-64), then going clockwise. You will have to place star's(*'s) on the correct coordinate, replacing the character underneath for all players. Additionally, if any of the players are on the start square of a slider, move them to the end of the slider before placing them. You can assume that there will be no collisions, before or after resolving sliders. You con't need to worry about the Home's or Start's. You can be 1-indexed if you want, but the test cases are 0-indexed. Not the answer you're looking for? Browse other questions tagged code-golf ascii-art kolmogorov-complexity board-game or ask your own question.